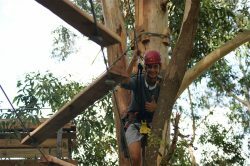 Abseiling or rappelling as it is commonly known around the world is an activity where you descend a rope down a vertical drop off or structure. 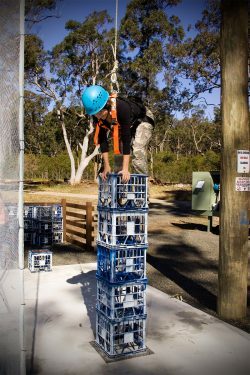 This variation of a climbing activity is where participants attempt to stack milk crates on top of each other while trying to scale them. One awesome ride, but double the fun. Speed over the beautiful Lake Ivan or Mangrove Boardwalk as you wave to your friend who is sharing the same experience with you. 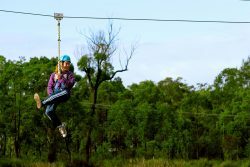 Whether it’s the 1, 2 or 3 person Giant Swing, this heart pounding activity is quite the adrenalin rush and well worth the thrill. 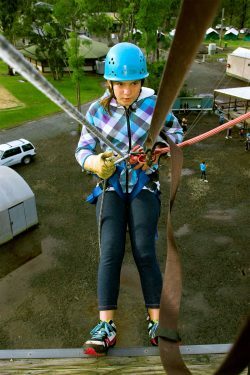 Our High Ropes Challenge Courses are suspended more than 2m off the ground. They are made out of wood, cables, ropes, steel, natural trees and artificial poles. This activity is quickly becoming more popular as a recreational sport. 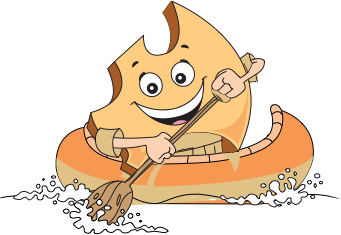 Not only is it a great all-weather activity, but it is a great way to encourage movement in most muscles of the body. Imagine the rush of leaping off a tall telegraph pole and trying to grab hold of a small trapeze that’s just a little bit further out in front of you than you’d like it to be! 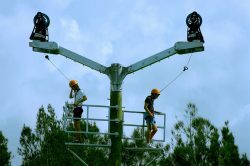 Securely fit your full body harness, put on your safety helmet, attach a special cable and then climb to the top of a very, very tall pole. Now simply step off!! 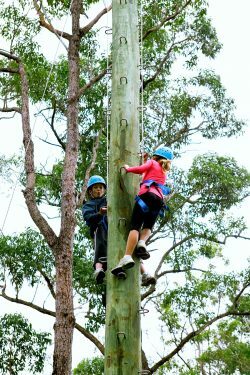 Staple Climb is a fun and challenging activity for our younger participants. 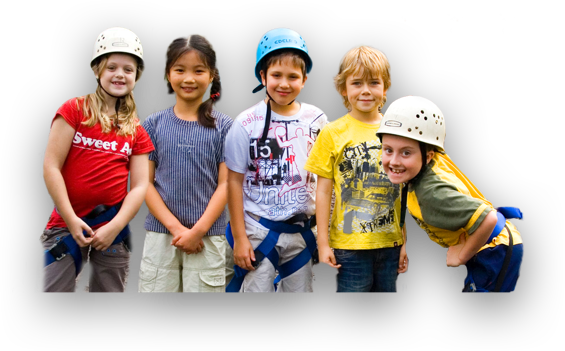 It is a great introduction to the skills of Rock Climbing in a safe and familiar environment. 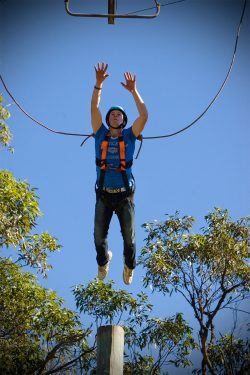 This is an aerial obstacle course that’s high on excitement and adrenalin. 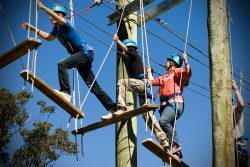 Working in teams of 4, participants are required to navigate a series of high obstacles involving steel cable ‘tight ropes’, platforms, swings and other great challenges. 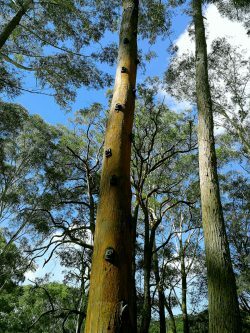 A variation to Rock Climbing where participants get to scale a 9m tree using strategically placed rock holds. This is a great activity for any experience level and can be made more challenging by using less grips. 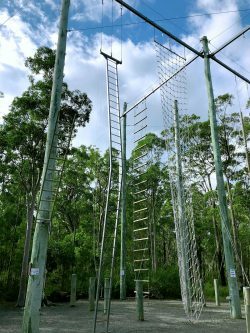 Specifically designed for many participants to climb at once, this activity is made up of ropes, cables, wood, steel, cargo nets, and a variety of other materials. 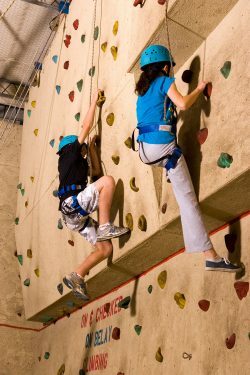 It acts as a vertical obstacle course and is one of the highest activities on site.